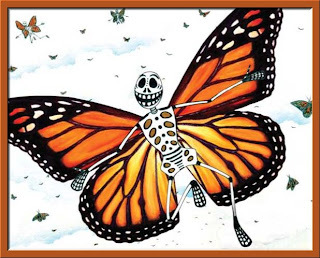 Today is All Souls' Day, the second day of the celebration of Dia de los Muertos (Day of the Dead). This celebration is to remember and to honor loved ones who have died. The graphic to the right is a colorful and whimsical example of Dia de los Muertos art. Since many cultures believe that butterflies are the souls of loved ones who have died, the graphic ties in beautifully with this post. My grandfather was an exceptional man, and I'm sharing this story about him which was written by my mother forty years ago. If you've been reading her stories that I've shared with you in the past few days, you'll know that Mom usually associated a song with someone she loved. I'll never know what song she associated with me. That will remain one of the unanswerables in my life. But although we saw this one special man from very different perspectives, the song Mom chose for him is perfect, and whenever I watch "The King and I," I never think of Yul Brynner when this song is sung. This song belongs to my grandfather. This man was my first love, my hero, my idol. I don't really remember when I first came to know him. I have vague memories of him when I was a small child. I can remember sitting on his lap "driving" the car; chasing cats beneath the cows when he was milking, causing the cows to kick over the bucket and making him lose his temper. I do know that I have always thought of him as handsome and as a manly man. He worked at many jobs because times were very hard in the late 1930s and 1940s. He took whatever jobs he could get and was glad to get them. He didn't like asking any man for his bread. When I was about seven, he took a job in a shipyard in Indiana. I didn't get to see him very often, so his visits were real treats. He was drafted into World War II shortly after that job in the shipyard. He chose the Navy and was in the very thick of the war for two years-- Okinawa, Iwo Jima, Luzon. He spent part of his time in the service as an anti-aircraft gunner on an LST. I can remember that sick feeling I had in the pit of my stomach when it had been a long time since I had found one of his letters in the mail box. I can remember the look in my mother's eyes when she didn't know I was watching her. He never bragged about his exploits. That spoke louder to me than words, for I knew where he had been. In my young eyes, he won the war! Without him the allied forces would have had a much harder time becoming victorious. My pride in him knew no bounds. No one was as brave as he. He was-- and is-- my own personal John Wayne. Archival photo. Grampa's ship was the 1030. After the war he became an electrician, which is a hazardous job and not for the weak-kneed or brainless. If there's a job opening, he has it. His schooling was limited, and I think he is embarrassed about this lack sometimes. There is no need. He owes no man. He takes good care of his family. He took care of his aged parents with love and gentleness until their deaths, stopping by their house every evening to talk with them and make sure they didn't need anything. If they did-- or if he thought they did-- he got it for them. He has a good heart and is always willing to help his fellow man. He has been slapped in the teeth by life several times, but he has never whined or whimpered. He has always met pain and adversity head-on and has asked for no quarter. Whatever he sets his mind to he can accomplish. He can be proud of the name he has made for himself. He is not without his faults. He is stubborn and bull-headed. He has a temper with a short fuse that tends to singe those standing close to it when it explodes. He is stingy with his compliments and words of endearment. You're not sure when he likes something, but there is no doubt in your mind when he doesn't like something! He is impatient. When he wants to do something, he wants to do it now regardless of what you are doing. He is inclined to be a "mite" nosey and quick to tell you how to run your own affairs. His way is the only way of doing something, and if you don't agree with his opinion, you're the one who is wrong. He works too hard, and he doesn't take care of himself. This man can infuriate me quicker than almost anyone I know. I don't consider many people worth losing my temper over, but he can make me talk to myself at times! In my more rational moments, I laugh over our spats, which are few, thank God, for I realize that I am so very much like him. I-- no doubt-- have been a disappointment to him at times. For one thing I'm a female and he is the type of man you picture having a son in his image to follow in his footsteps. For another, I'm a fat, stubborn, bull-headed, opinionated female who let herself get in a rut. I've been correcting some of these faults lately, but he has yet to comment. Maybe he's afraid that if he does comment, the improvements will disappear. This man has a sense of humor and a way of describing things that is priceless in my estimation. He has coined some descriptive phrases that have become permanent fixtures in the family lexicon: "so dumb he could mess up a three-car funeral procession," "big enough to go hunting bears with a switch," "if a grasshopper had his brains, it would jump backwards," "slower than the Second Coming of Christ." He has a laugh that completely breaks me up. If I were dying a horrible death in excruciating agony and heard his laugh, I would probably die laughing! He is a plain-spoken man, but with a sense of propriety regarding those whom he considers to be ladies. I once told him a slightly off-colored joke just for darned orneriness. He couldn't look me in the eye. His face reddened a bit, he chuckled faintly, then he left immediately. I heard from someone else later that he thought that joke was one of the funniest that he had ever heard. He just didn't want me to be the one to tell it to him. His love for my daughter has been beautiful to behold. He fell in love with her the first time he saw her. I remember asking him what he thought of her. He said, with a husky voice, "It was just like looking at you when you were a baby!" I caught a glimpse of what he must have looked like when he saw me for the first time. I treasure that glimpse. He has given my daughter all those endearments that he has been so frugal in giving to others. He has been her surrogate father since her own father died when she was a baby. She has now reached womanhood, and he doesn't quite know how to handle the situation. One of his defenses has been to treat her like she is still a little girl. He has a fit when she does things other girls her age do. She is planning to go to college this fall and has been accepted at Brigham Young University in Provo, Utah. She and I will both be going. He never mentions this fact. He acts like he doesn't know about our plans. When my husband died, he came to the TB san where I was a patient to break the news to me. He minced no words, gave it to me straight from the shoulder. He offered no words of sympathy. He realized that I didn't want gooey words or tears. He gave me what I needed-- strength. He was there. I knew I could count on him for anything. He gave me himself to use in any way I wanted or needed to. How paltry anything else would be compared to a gift like that. I cannot express how very much that gift meant to me. I have never given my admiration or my love easily, so I consider it worth something. I like this man immensely. I admire him greatly. I love him dearly. I will until the day I die at the very least. This is no ordinary man. 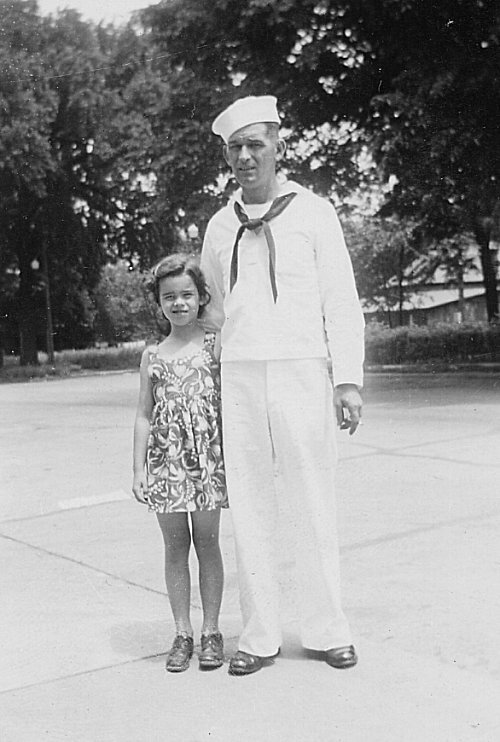 He is Earl Edwin Brookshier, my dad. What a treasure your mom left you in these writings. I just can't get over her talent. Also, I'm very taken with the November painting by Deborah DeWit. I fit right into the setting. Joe-- You're welcome. I'm glad you've enjoyed them. Barbara-- I"m glad you like them, and this month's DeWit painting!